From pricey luxury sedans to popular hybrid cars, automobiles made overseas are stacking up at ports and parking lots around the United States as supplies far outstrip demand amid the nation's worst auto market in more than 25 years. At the Long Beach port near Los Angeles, Toyota Motor Corp vehicles including Prius hybrids, FJ Cruiser sport utility vehicles and Lexus IS 250 luxury sedans are being stored on a vast construction site that will one day be a new container terminal. 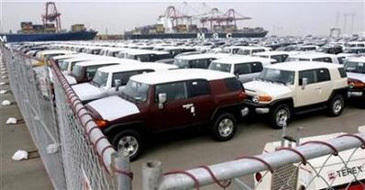 The site became a gigantic parking lot when Toyota and Daimler AG's Mercedes-Benz asked the port for space to store thousands of vehicles that dealerships have not been able to take on due to sluggish sales. "It's unusual that they would be here longer than a few days, but that's the situation now," said Art Wong, a spokesman for the Port of Long Beach. "They can't move it through their pipeline fast enough so they are asking for additional space while they keep their vehicles here more than a few days, and in some cases more than a few weeks." The port has not counted how many additional cars were being stored, but Wong said Toyota has leased an additional 23 acres of space while Mercedes-Benz has leased about 20 more acres. Nissan Motor Co Ltd, which brings its cars in through the neighboring Los Angeles port, had been talking to Long Beach about leasing space, Wong said, though that arrangement fell through. A Port of Los Angeles spokeswoman, Theresa Adams-Lopez, said Wallenius Wilhelmsen Logistics (WWL), which operates the terminal that brings in Nissan's vehicles, had shifted vehicle storage to another state. Nissan spokeswoman Katherine Zachary said the company last increased its space at the Port of Los Angeles in February. "As a normal course of business, we've got cars moving out of there all the time to various points across the country," Zachary said in an e-mail. WWL, which is based in Norway, would not comment on specific customers, but said auto inventories were building up across the United States. "We are seeing cargo buildup at ports of entry on both coasts as well as at other inventory points such as factories and rail yards and dealerships," Christopher Connor, the head of WWL's business in the Americas, said in a statement. Other ports are also seeing a buildup of cars, though not all of them are leasing large tracts of land to automakers. The San Diego port, which brings in Honda Motor Co, Volkswagen AG and Mitsubishi Corp vehicles, has about 14,000 cars on its property. That's about 2,000 more vehicles than usual, according to spokesman John Gilmore, who said the additional cars belong to a range of manufacturers. Global automakers have been sideswiped by the collapsing demand for new cars and trucks. A market slowdown that began in the United States has spread to Europe and Asia. Detroit's embattled automakers have been pushed to the brink of failure by the downturn and are asking the U.S. Congress for a $34 billion rescue package. But the sharp decline in sales in October and November blindsided even the industry's better-performing manufacturers like Toyota and Honda. Toyota said on Friday that it was cutting North American output by idling factories that produce vehicles such as the Camry and Corolla, the Japanese automakers' top-selling cars. Toyota spokesman Mike Goss said inventory had been pushed to "unacceptably high" levels that would take 80 to 90 days of sales to clear. That is still less than the 115-day supply of inventory on average for General Motors Corp, Ford Motor Co and Chrysler LLC, but it is double Toyota's inventory levels of just a year earlier. The surge in inventories has been a small blessing to some in the industry. Automobile processors, who wash, repair and accessorize imported cars before they head to dealerships, said revenue from storing cars is helping offset the market's overall sluggishness. MidTexas International Center Inc, whose Midlothian, Texas, facility processes vehicles for Kia Motors Corp, Mazda Motor Corp and Toyota's Lexus, expects to break even this year despite the dismal auto market because automakers are paying for cars to sit on its lots for longer.